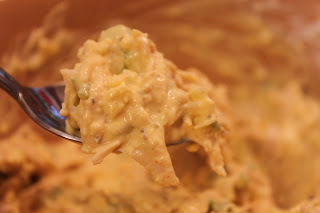 *This chicken mixture will fill 36 egg halves. 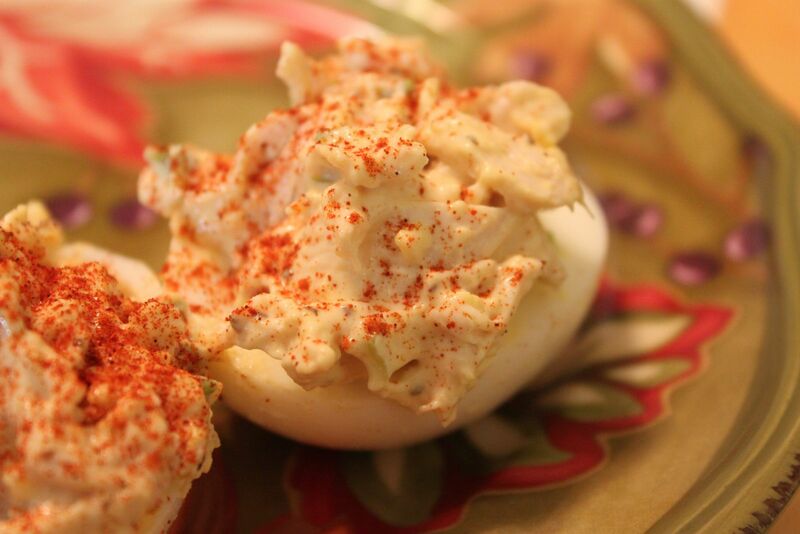 I only boiled six eggs for this recipe and used the remaining chicken mixture to make sandwiches - yum!. 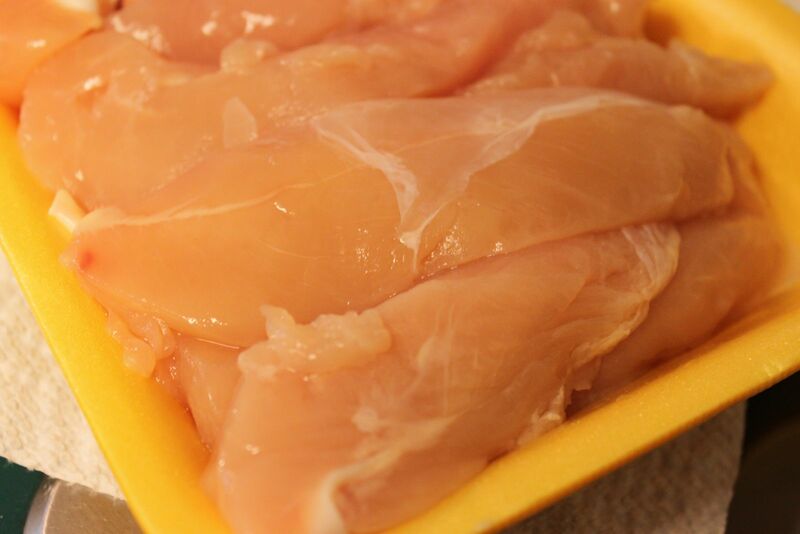 If you do boil more eggs, add the extra yolks to the chicken mixture, too. I used 1-1/2 lbs. of chicken tenders. I boiled them in salted water until done, about ten minutes. Any chicken will work and I fully support the use of rotisserie chicken. 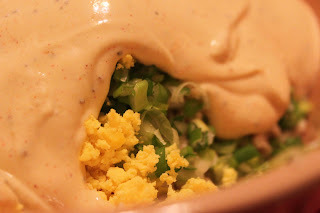 Boil the eggs. 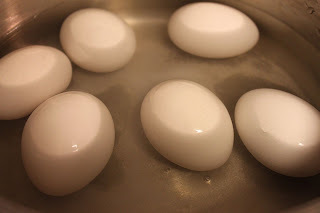 I start my eggs in cold water and add some salt. I find the salt helps prevent the eggs from cracking (sometimes). I slowly bring the eggs to a boil, and let them boil on medium-low for ten minutes. 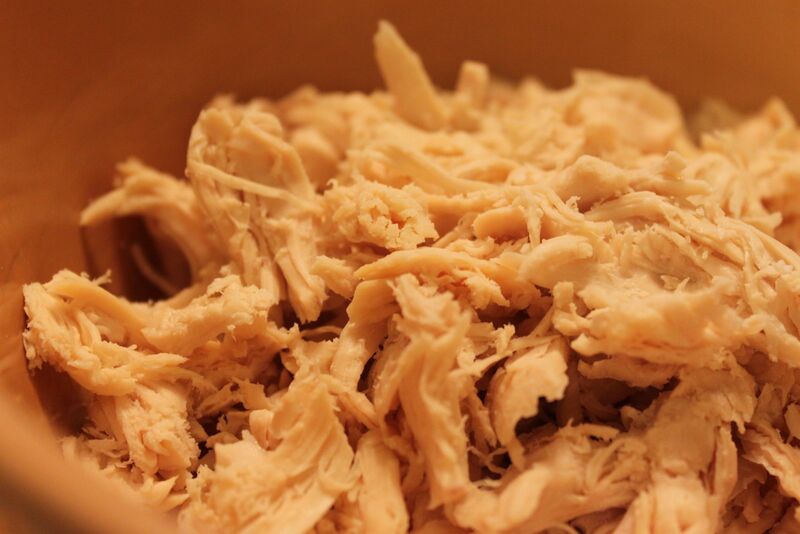 Once the chicken was cooked, I shredded it into a large bowl. 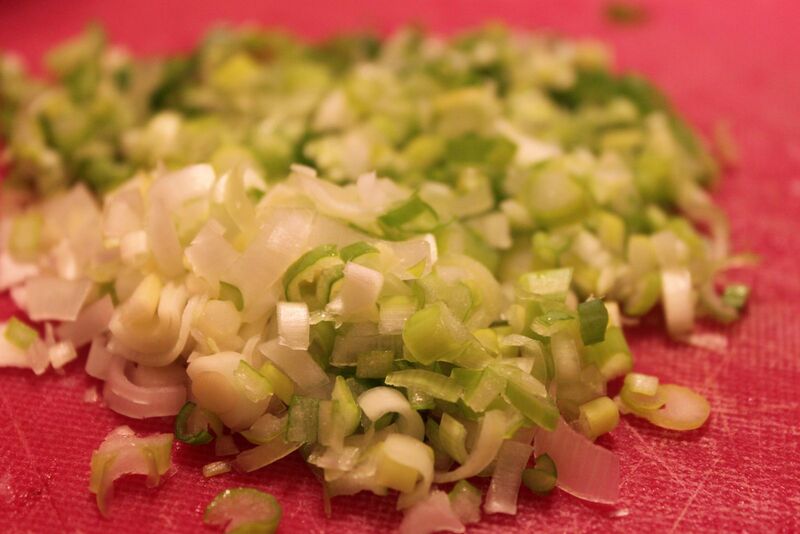 My husband chopped three green onions for me. He's the king of "finely chopped". Meanwhile, allow the eggs to cool. Peel and slice in half. 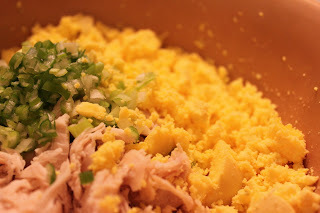 Scoop out the yolks and add to the chicken and onion mixture. I put the yolks on the side of the bowl and crushed them with a fork. 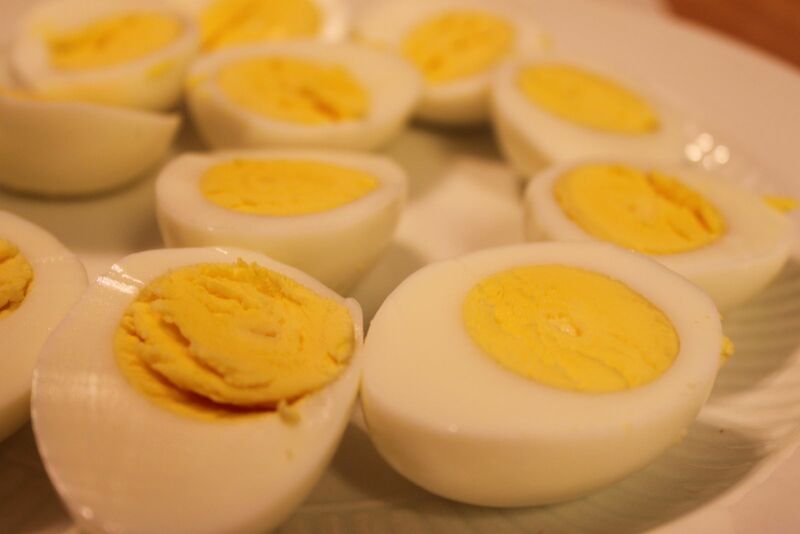 This was six yolks but throw the extra yolks in if you make more than six eggs. I like to make my sauce in a separate bowl. 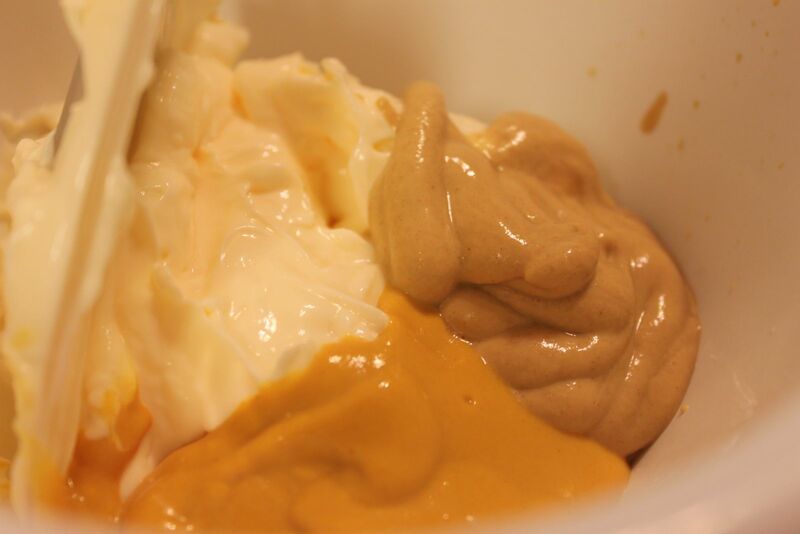 I started with a cup of mayonnaise, and a tablespoon each of yellow and dijon mustard. I seasoned with a 1/4 teaspoon each of course black pepper, celery seeds, paprika, and garlic salt. Mix well. Pour over the chicken and egg mixture. Blend well. Use a tablespoon to scoop the chicken mixture into the eggs. Looking good already! 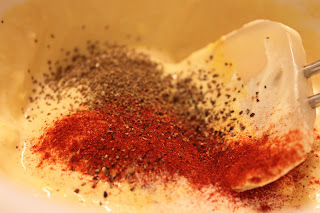 Now, I have to have paprika on my eggs! It's a tradition around here. 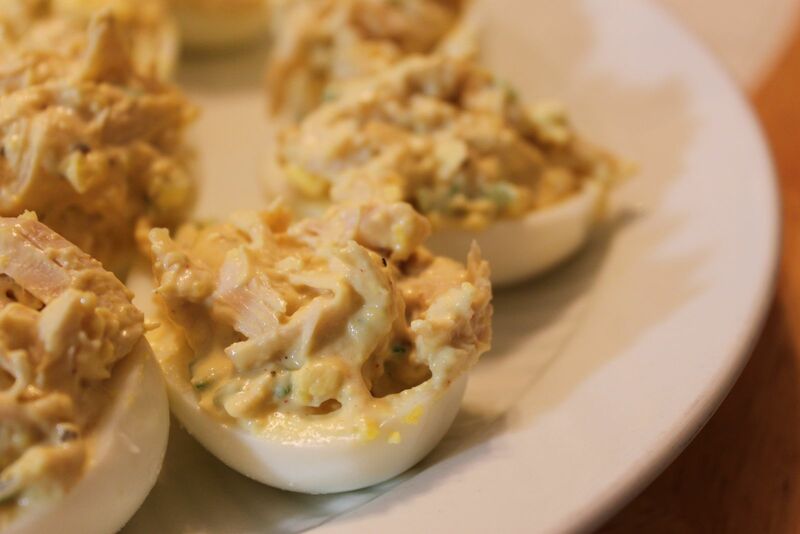 Now, that's the perfect appetizer for the man in your life - pure protein and no fork necessary!! Yummy looking! Thanks again, Kim!